This tab is removed in v7.5.3+ as the settings are now controlled by the view-type-specific controls in a window tab's properties pop-up. This gives easy access for setting a number of attribute controlling the appearance of the current map. Defined colour list pop-up menu. translucent option. Sets $Opacity to 50(%). Opacity. 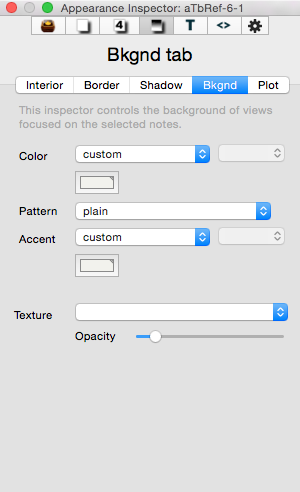 Sets $MapBackgroundFillOpacity, controlling the visibility of the background image.